From Thomas Sabo, this Sterling Silver Anchor Bracelet is a symbol of love and hope. It is embellished with Cubic Zirconia's to give it an extra sparkle. 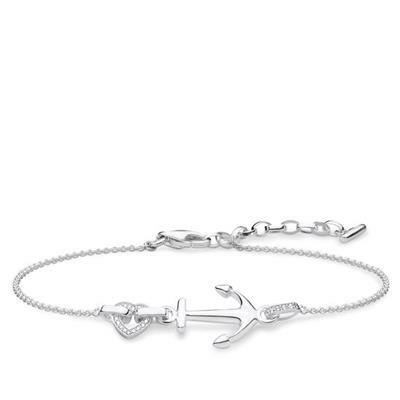 The Thomas Sabo Sterling Silver CZ Anchor Bracelet is a delicate and feminine piece. It's the perfect gift for yourself or a loved one, and would add a dazzling touch to any outfit. The bracelet is crafted from 925 Sterling Silver and is decorated by hand with sparkling stone embellishment. It features an anchor design with a Cubic Zirconia heart attached to one end of the anchor.